This winter has been a very interesting one for the weather up here in Truckee / Tahoe, California. Actually, it might be more "uninteresting". We have had very little snow compared to usual years. I was hoping to have many more new snow scene photos by now but so far, it's been all about shooting ice. Prosser Creek Reservoir is a little lake near my house that usually freezes over in the winter. It usually has a very short ice skating season, if any, because the snow usually covers the ice pretty quickly. With very little snow at the ski resorts and no snow at most of the frozen small lakes, many locals have been enjoying an incredible ice skating season up here. I've been taking advantage of the ice by getting some pretty cool photos of it. 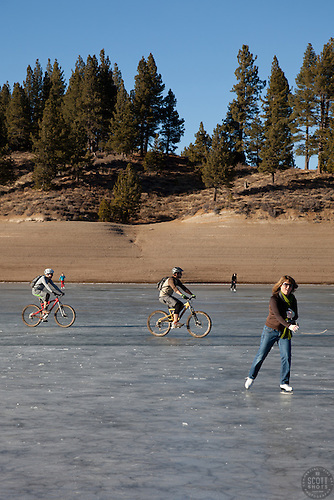 "Ice Skaters and Bikers on Prosser Reservoir 1" - These ice skaters and mountain bikers were photographed on a frozen Prosser Reservoir, Truckee. 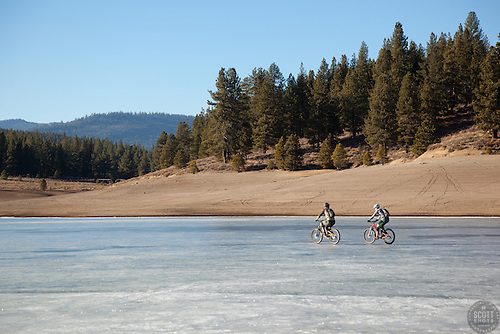 "Mountain Bikers on Prosser Reservoir" - These mountain bikers were photographed riding on ice at Prosser Reservoir, Truckee. 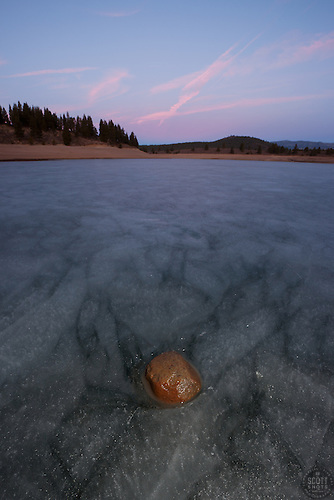 "Rock on Prosser Reservoir Sunset" - Sunset photograph of a rock sitting on top of an icy frozen Prosser Reservoir in Truckee, CA. 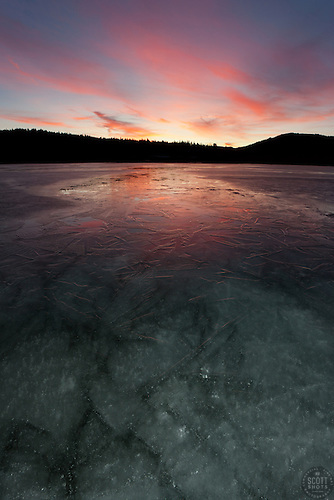 "Frozen Prosser Reservoir Sunset 4" - A colorful sunset photograph of an icy frozen over Prosser Reservoir in Truckee, CA. Please enjoy this slide show below of all the icy frozen over Prosser Creek Reservoir photos that I've got this year, so far... Most of the images are available as large fine art prints, photo gift items, and to license, download and use as stock photography. Click on an individual image to see a larger version, and click "buy photo" for purchasing options.